With the choice of an afternoon shopping expedition with my wife on offer, I took the safe option and went fishing instead, not wanting to upset her acquisition flow, allowing her to browse at will. All I needed now was to catch a few fish and we would both be happy. My local recreation ground, with it’s pond within easy walking distance, can be relied upon to provide a busy afternoon’s sport, so with a kiss from my wife, the trolley was loaded and I was on my way. I’d cut this swim out six weeks before on my last visit, then the leaves being still fresh and green, but now the gold of autumn has taken over. A mix of liquidised bread, black with hempseed, was pressed into loose balls and thrown in at between 7 and 8 metres, with a scattering of sweet corn over the area, before setting up. There being no wind, a 0.4g float set two feet deep, to a size 16 barbless hook would do the job, shotted to show the last 6 mm of the tip. 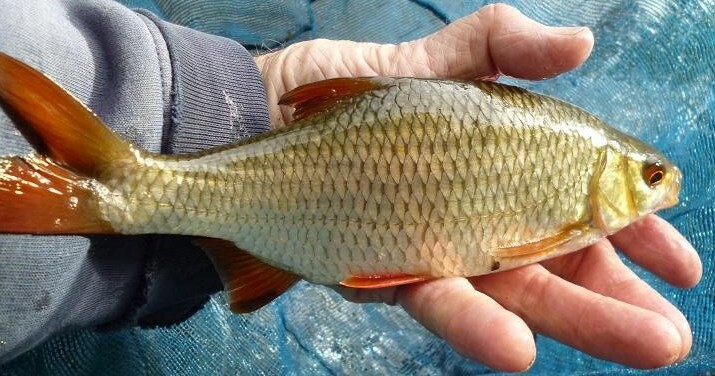 Rudd are usually a problem for the first 30 minutes of fishing here and when the float marched across the surface seconds after the first drop in, the pattern seemed set, but the elastic stretching out from the pole on the strike meant a small common had taken the sweet corn. That would do nicely for a start. 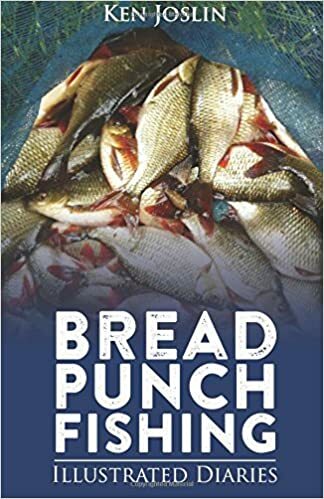 My next cast produced a few knocks and dips, but nothing to strike, so the sweet corn came off and a 6 mm pellet of punched bread was substituted. The float sank in a series of dips and I lifted to feel the juddering fight of a crucian, pulling the pole back to unship the last 3 metres for netting the zig zagging carp. This little thumper set the scene for a succession of crucians on the punch, the net coming out at regular intervals, the hook barely in the skin of the lip. A couple of missed bites made me switch back to the corn, getting a more positive bite and a better crucian. The fish here are a mix and match, this one having a fan tail, gold fish and koy having been released from family ponds appearing from time to time. I even caught a terrapin here once. This was the last crucian of the afternoon, another fan tail, variety being given by a few more small commons, 3 hours from 1:30, until 4:30 being enough time to net about 30 fish for 11 lb. By the time I’d walked back home and put the gear away, my evening meal was on the table. That’s what I call teamwork. My plan to fish the weir pool of my local river fell at the first hurdle today, when a drive-by revealed a van parked in the gateway and a leger angler seated in the only swim. Winding down my window, I asked if he’d caught. A slow shake of his head told me that hadn’t, or that he was being cagey, not wanting to pass on his success. That swim is full of big roach, chub and the occasional carp; he must have caught. Where now? The river flows away from the lane, behind private houses and across fields, passing under a main road two miles away, where I now headed off to investigate. I have driven over this bridge many times, but the lack of parking and chest high wild hop vines have put me off attempting to fish in the past. An overgrown gateway a hundred yards away, allowed the van to squeeze into a space with the wheels off the roadway, while with the onset of autumn, the hops were dying back. It was worth a try. The weir swim is next to the parking spot and hadn’t packed the trolley, but now I needed it. Deciding to travel light, I set up my 14 ft match rod at the van with a 4 No 4 ali stick float, taking only a landing net and my bait bag on the hike. 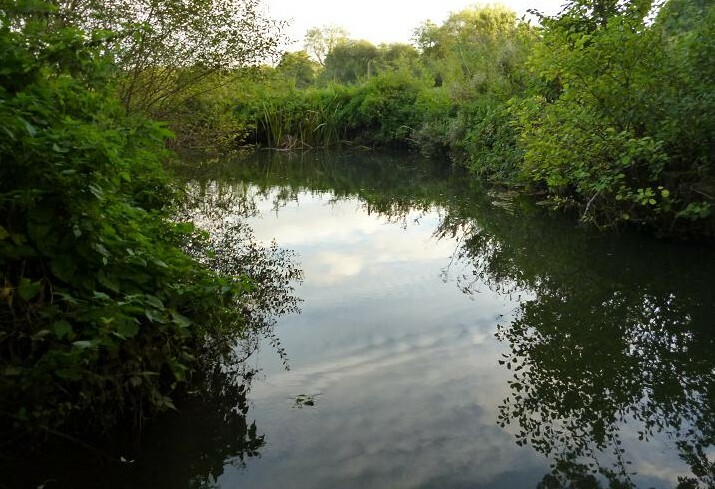 Getting down to the river proved a challenge, a steep slope, coupled with the unrelenting vines and stinging nettles wrapping round my ankles, made me consider the wisdom of my decision to fish. Once down on the flood plane, the pool looked promising, the flow from under the bridge forcing along my bank, then swinging across to the exit, creating an eddy along the opposite side. Making myself comfortable on the bank, I laid out the bait trays from my tackle box on either side, while sitting on the box cushion, quite a home from home. 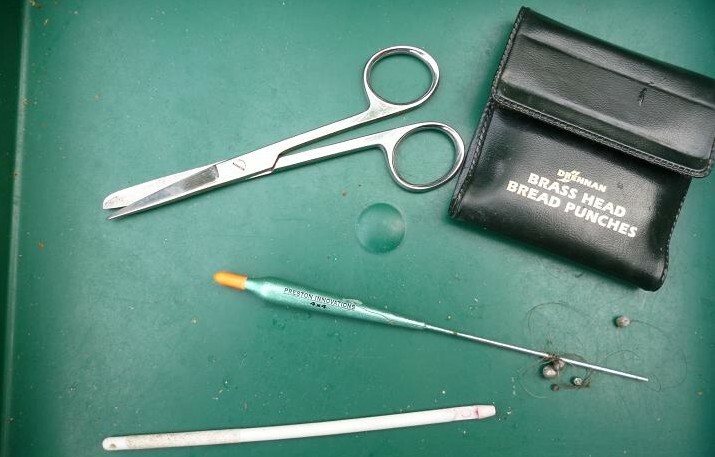 While getting ready, I’d put a couple of balls of crumb down the middle of the flow, following with a single before dropping the float in, baited with a pellet of punched bread. I’d guessed the depth at three feet and was not surprised to see the float drag under. Too shallow. I lifted the rod to confirm, disappointed that I’d hook the bottom, when the rod bent over. The float traced a Z in the surface, then disappeared. A large fish had been woken up, slowly at first, then bursting into life to rush across the pool and down the far side toward the tail, forcing a rapid backwind of the reel under pressure. It turned, coming back along the near bank. This river has many carp, due to the lakes along it’s length and a flash of bronze scales seemed to verify my suspicion, but another surface roll exposed the gaping white lips of a chub, which dived into the reeds below me, before being forced out into the waiting landing net. A long lean chub, it weighed in at 3 lb 4 oz, way off it’s expected winter weight, which could exceed 4 lb. Not bad for a first cast with roach in mind. Released it sank slowly away with a flick of the tail. Ready to fish again, the float followed two more balls of bread into the swim. Looking down to free line caught on a nettle, I missed the float going under, searching the surface to see the line speeding away downstream. I was in again with a bang, the rod arcing over into a more powerful fish, that was already heading for the exit. Again on the backwind, I leaned back, letting the rod do it’s work, the size 16 barbless hook holding. The relentless run had to be stopped. If the fish got out of the pool it would be lost. 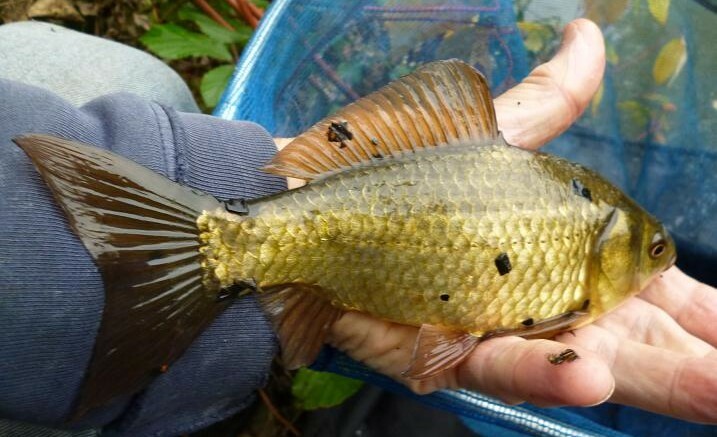 My days of chasing a fish downstream are long gone and I was relieved to see the chub broach the surface, turning to fight up the middle of the run. After battling right under my rod top, it popped up to the surface like a depth charged submarine and just lay there to be netted. Four ounces heavier that the first, this chub was shorter, but “chubbier” in much better condition. Two in two casts, how many more were down there? Now regretting taking my keep net out from the bag, to cut down on weight for the walk, I returned the chub before sorting out the tackle for another trot through. Two more balls plopped in followed by the float. It sank out of sight as though a lead weight was attached, the rod top following it down the instant I lifted. Ping! Bumped it! The float sprang back, wrapping round the tip in a bird’s nest tangle. This was game over. Spare float rigs were in the tackle box, back at the van and there was no way that I could untangle the knot. I could go back and return with a float to start again, but decided to pack up. This was only an exploratory visit anyway, which had turned out better than expected. Next time I will come fully equipped with the tackle box on my trolley and a keepnet. An invite to fish a lake owned by my local council, was followed up by a visit this week. Needing Google maps to find the water, which sits in one corner of a recreation ground, surrounded by a network of streets among a 70’s housing estate, I arrived to find a well laid out car park, with a path down to the lake a 100 yards away. 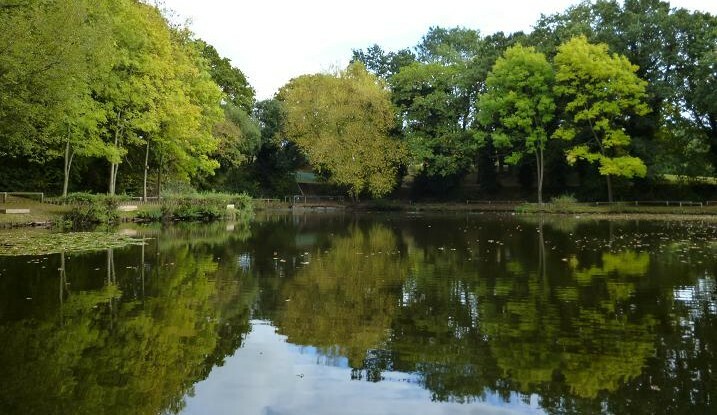 Part of a project to involve the community in nature projects for the whole family, the lake has benefited from tree clearance and the creation of six disabled swims next to the car park, while paths and existing swims have been made safe. 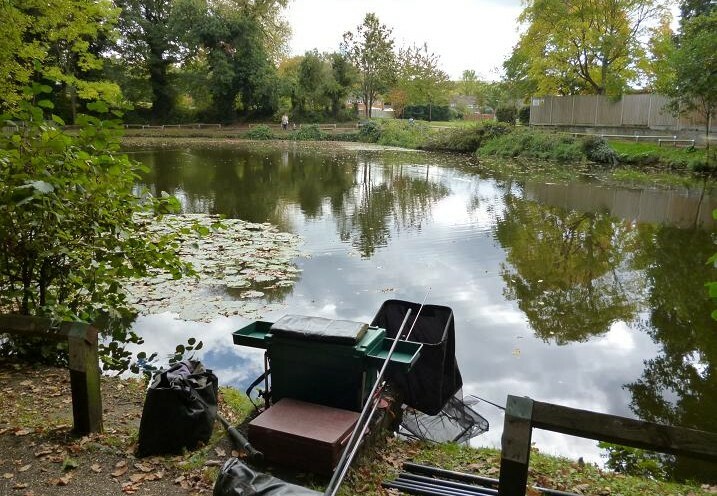 A club was recently formed, offering access to an on site community hall, where regular nature based events have been held, while the inclusion of fishing tuition for the whole family, by qualified coaches, has raised awareness of fishing as a safe, healthy pastime for youngsters. Looking out at the lake for the first time, a patch of lilies to my left looked very fishy, although with rudd topping all over, I thought that any swim would have done. Plumbing the depth, I found the bottom shelving steadily away to 4 ft at 7 metres and selected a 4 x14 float to suit, the shot bulked to 18 inches, with a No 6 shot six inches from the hook. On the opposite bank a mother and child were busy emptying a bag of bread into the water, feeding the ducks. 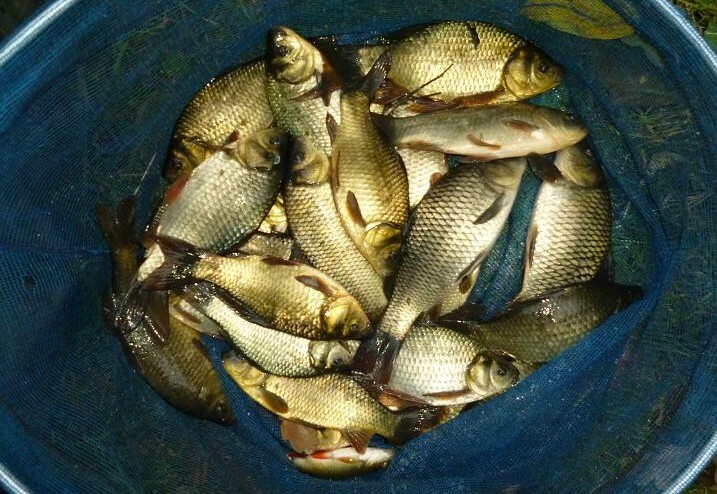 Bread must make up a fair bit of these fishes’ diet and I opted to start on the bread punch, having fed three egg sized balls of ground bait, heavily laced with hemp seed and sweet corn, in a tight group 7 metres out close to the lilies. First cast in the float dipped and sank in seconds, swinging in a well rounded roach in good condition. In again, the elastic came out on my next lift, this time a thumping rudd, that needed the landing net. This rudd had lost it’s top lip to an over eager angler, who preferred barbed hooks, my barbless size 14 slipped out easily once the pressure was eased. Off to a good start, I soon tried a sweet corn, netting my best so far. 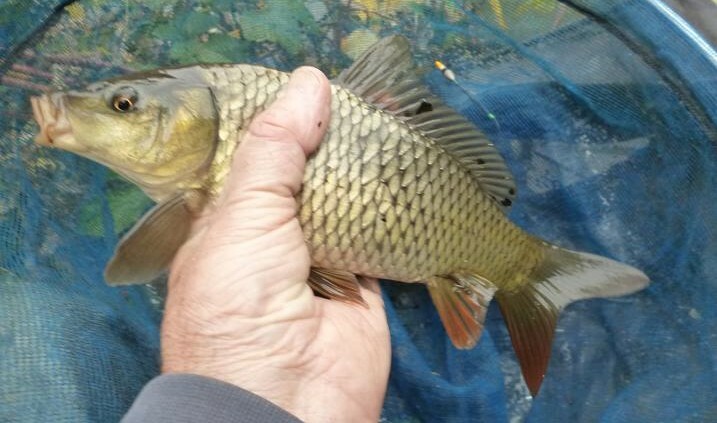 I continued to catch, this roach having a lot of rudd in it’s genes, the pole elastic staying out, until just before the net. 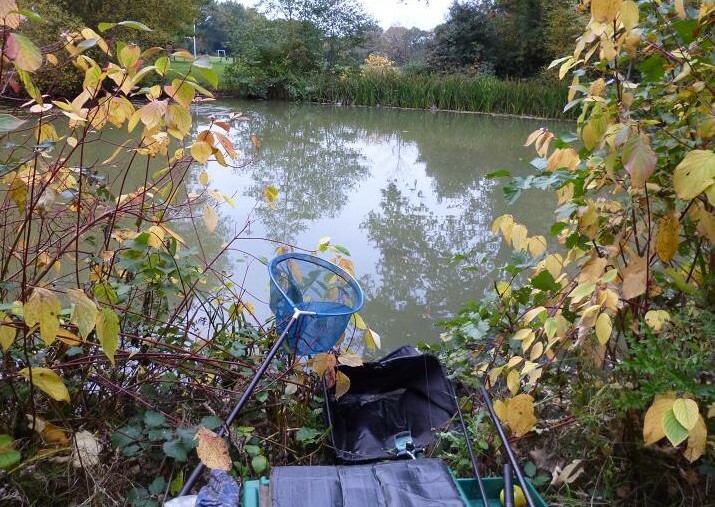 Half an hour into the session, the silver fish stopped and small bubbles began to burst on the surface; a better fish was in the feeding zone. Selecting a large piece of corn, I dropped the bait on top and waited. Rings appeared around the float, before it lifted slightly, then slowly moved off, until it was gone. I lifted and felt the sudden surge of a very good fish, as it ran toward the middle, scattering rudd in it’s wake, the pole bending against the heavy elastic, which stretched out beneath the surface, arcing round back toward the lily bed. Pushing the pole hard over to the right, the fish surfaced in a boil, a dark body visible for a second, before it’s broad black tail forced down again. I was winning the battle, keeping the tench clear of the lilies with it rolling on the surface, then lying on it’s side with a single pectoral fin erect as if in surrender ready for the landing net. A female tench in perfect condition, which weighed in at 4 lb 4 oz, my best for a long time and certainly the largest I’ve netted on the pole, making my choice of red 12 -18 elastic, the right one. 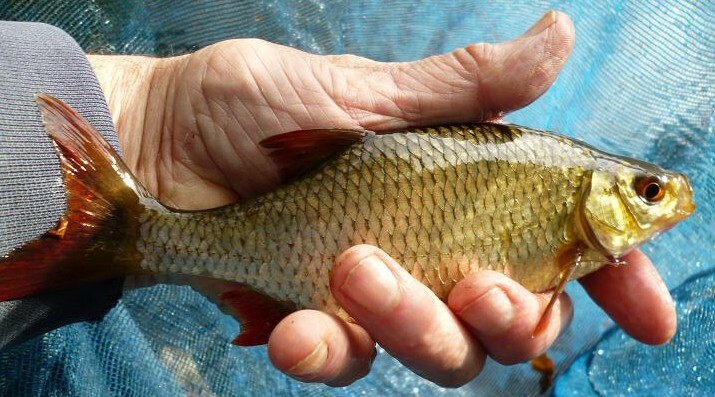 I continued pulling roach and rudd from the same spot, bread punch and red worm reviving the action, when the bites slowed on the corn. More bubbles produced a perfect tench bite, which I missed, probably in haste. I was joined by another club member, who settled down to fish on the other side of the lily bed. He spotted a large koy carp among the lillies, giving me a running commentary of it’s whereabouts, which was well clear of our baits. Dave, the other angler, gave me the low down on what was in the lake, no pike, but a few good perch, carp and koy, plus a big goldfish. 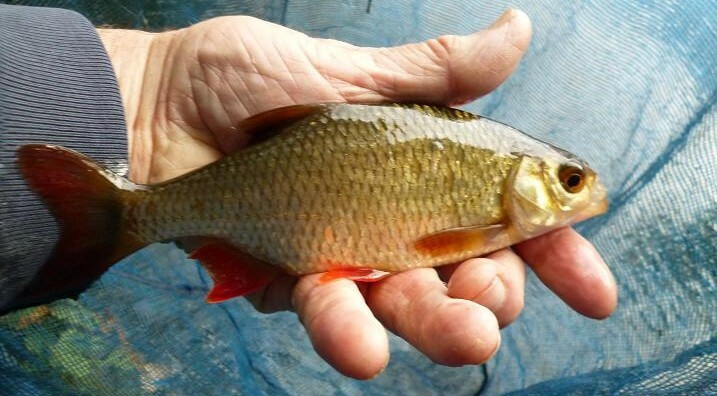 The environment agency had also introduced a thousand crucian carp into the lake during their improvements, but they had so far failed to show. A shower of rain seemed to pull the switch on my bites, so at 4 pm, by which time I would have expected to be catching more tench, I packed up. 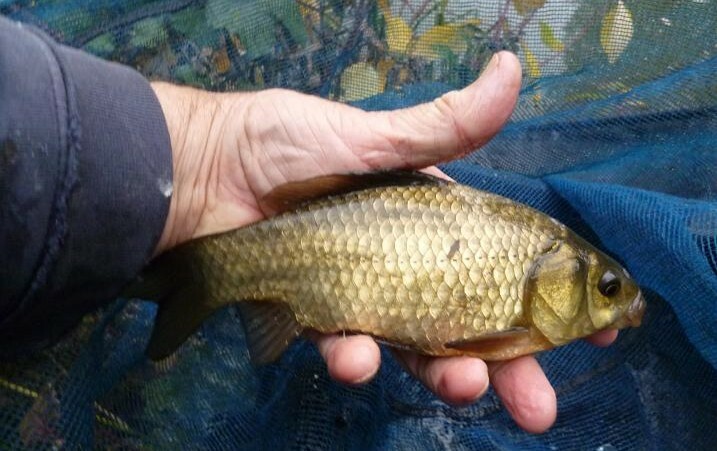 The tench dwarfed some of the quality roach and rudd in my net, estimating around 10 lbs taken in two and a half hours of fishing. 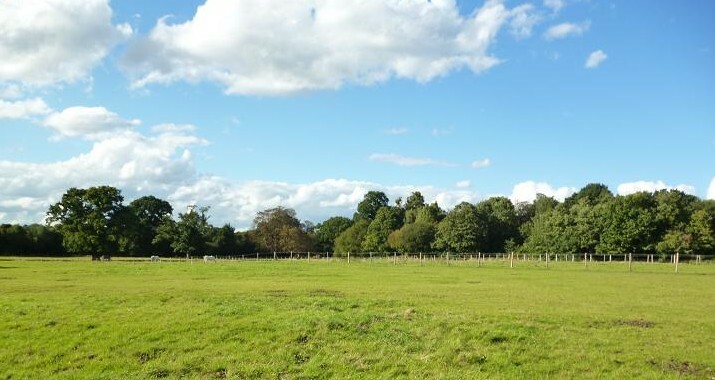 The Braybrooke Nature and Fishing Club http://www.bcnfc.btck.co.uk/ are offering a family membership, (two adults and three children) for £25, with an adult ticket at £20. Seniors £15 and juniors over 12 £10. The autumnal equinox was well past, but the indian summer was causing me to regret the sweater under my shooting jacket, as I trudged the rides of the equestrian centre in search of rabbits, the sun blasting out from behind clouds in an otherwise clear blue sky, causing me to overheat. Walking through the wood offered only one fleeting flashing white tail, as a rabbit dashed across the path from cover on my right without the expected pause, before it hopped to safety among the nettles. 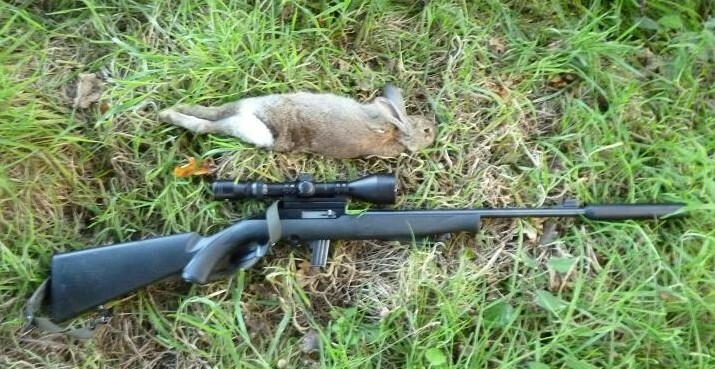 Too quick for a rifle and too close for a shotgun, I consoled myself that it was a fat healthy adult, which was clear of the myxomatosis I’d seen on visits to other permissions lately. Where ever I looked were squirrels collecting up the harvest of acorns and chestnuts, being tempted to knock over a few for a pie, but know from experience, that once distracted by squirrels, an unseen fat rabbit will bound away from a clear shot, when disturbed. Patrolling all the usual rabbit hideouts without success, I committed to the long walk along the perimeter fence, where once, every hundred yards would have offered a rabbit, or two, but the reality of today is that these warrens are no longer occupied. Welcome news for the owner and safety for his riders, but slim pickings for me. Still the exercise is good, in clean fresh air, something I reminded myself of, as sweat trickled beneath my cap into an eye. At last, brown shapes meant rabbits along the fence line, feeding on the new shoots of grass, pushing through from the recent cut. Over a hundred yards away, I crouched low, using a slight rise in the ride as cover, then belly crawled within forty yards, with the Magtech .22, resting the rifle on my bag for a prone shot. Sighting on the nearest and largest animal, I watched it raise it’s ears in alarm, aware of danger, then body pressed to the ground, it sped across the ride into the undergrowth. Other heads were raised and the cross hairs fell on the next in line. Pop, it dropped from a head shot, the others gone in an instant. Collecting the young buck, it was paunched and bagged before moving on toward a small wood on the far boundary, seeing another small group of rabbits in the field at it’s edge, in range of the HMR, but not the .22 in my hands. This time I had no cover, observing them melt back into the wood one by one. 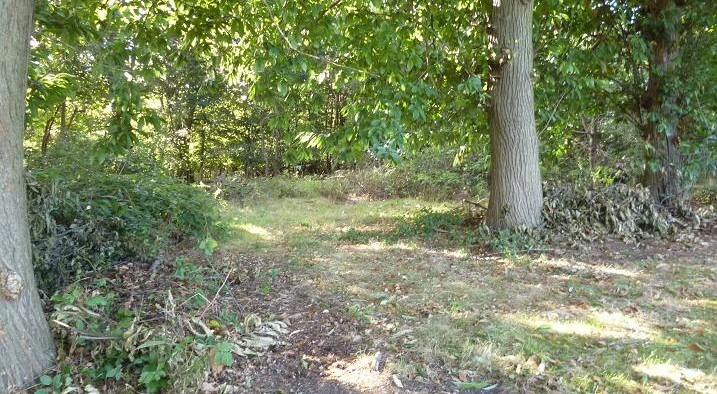 Reaching the wood, I could hear a couple of rabbits casually making their way through the undergrowth, unaware of my presence and I waited against a tree for sight of them. The rustling continued then stopped and could just make them out beyond a bush about twenty yards from the clearing. They faded from view. After ten minutes I was convinced that they were gone and picked up my bag to go, spooking one into the open, so close that I had to aim high to allow for the scope height on the rifle. Despite the blurred image, the bullet hit head on, tumbling the rabbit. Smaller than the first, but worth taking, I bagged it up and carried on through the wood without further success, disturbing a red coated muntjac deer from it’s slumber, before coming back out into bright sunshine. 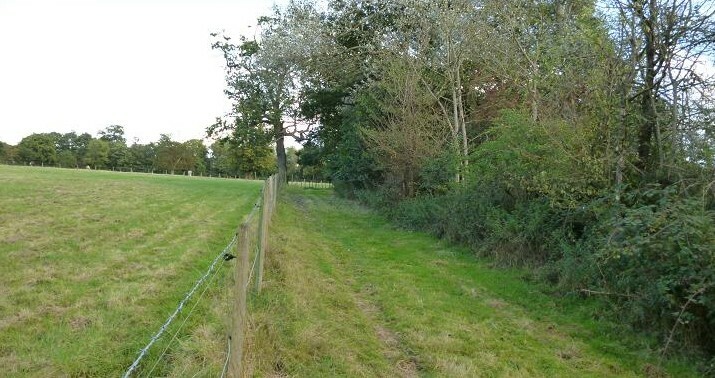 With two rabbits weighing me down, I decided to cut back across the paddocks toward the stables, taking a new route alongside a copse in the hope of more quarry, but again no bunnies. Calling it a day, I was soon back in the real world, the van stuck in the rush hour traffic. 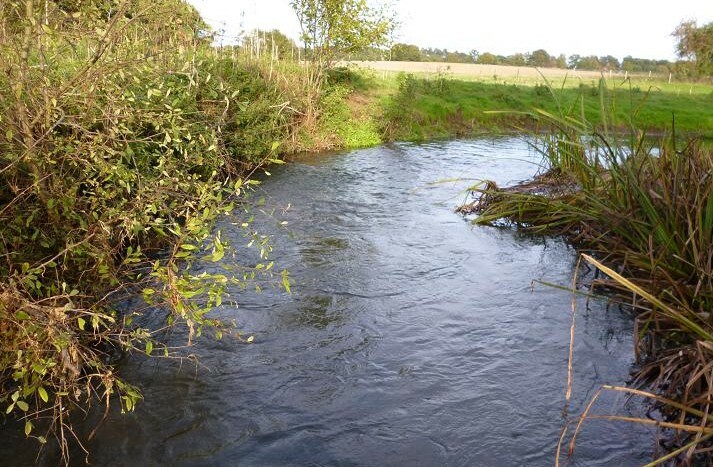 Due to a steady decline in the fishing on my syndicate trout stream this year, I had stayed away, putting the poor results down to too much rain, then not enough; too cold, then too hot, not willing to accept that this once delightful little Hampshire river had fallen off the chart as a viable trout fishery. With only a day left to the season, a warm bright evening drew me back, in the hope that my fears were unfounded. This pool looked perfect, clear with a good pace in and out. Standing in the shallows, I cast a favourite size 18 gold head Hares Ear to all the areas that had given me results in recent years without a touch, no small browns, or dace from the shallows, chub from the slack by the reeds and certainly no trout from the centre of the pool. A few small dimpling rises began at the tail of the faster water, as a cloud of tiny flies passed back and forth across the surface. Encouraged I changed over to a size 18 dry Sedge in an effort to catch something. A dimple in this pool once produced a 4lb chub. After a couple of nudges, the sedge was pulled under and a large minnow was catapulted skyward. Only minnows. Moving round the pool, I made casts up into the faster water with the dry fly, surely this would produce? Although daddy long legs, skipping and skating across the surface, were being ignored, I was convinced that this agitated ripple would raise a fish to the Sedge, the wind allowing me to keep the leader off the surface without any drag. Presentation seemed perfect and my anticipation was in top gear, but again nothing. Back to the Hares Ear and despite a couple of mini taps, which I put down to more minnows, nothing. 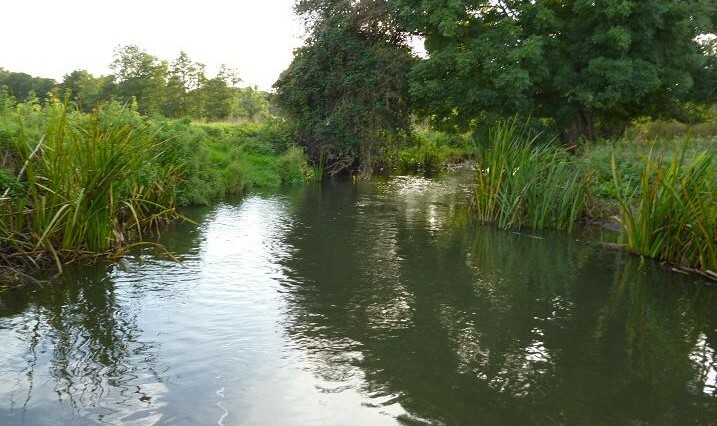 Last year my final visit had been busy on this pool with good sized dace and a 15 inch brown crowning the evening. 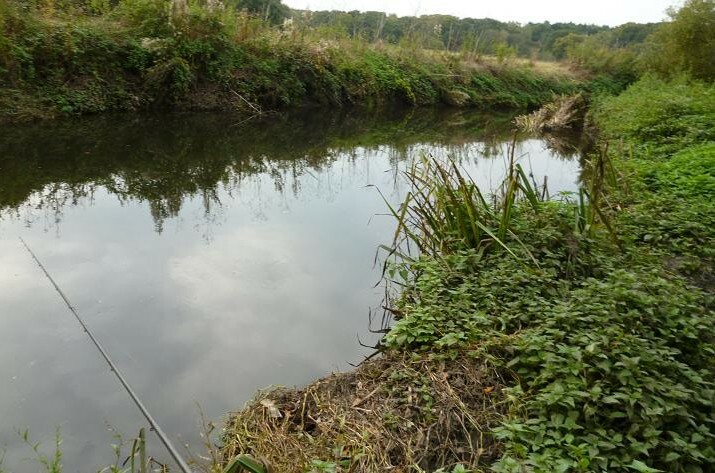 Moving below the pool, I got back in the river to work the nymph up through the run off, the steep overspill usually stacked with small trout and dace among the weeds and eddies, ready to provide fast and furious sport, as they darted out to seize the goldhead. Once again, despite it’s looks, the river failed to raise my hopes, making me wonder whether a pint of maggots would have changed my fortune. I had taken enough mental punishment and decided to try a pool above the road bridge, which has rarely failed me. The wind had dropped to leave an untroubled surface, allowing a safe cast of the nymph well up into the flow, as it came round the bend, passing the hot spot beneath the bushes, all without a tweak of the greased leader. The Sedge was tied back on and finally a last gasp Daddy Long Legs, all without even an investigation by a cautious fish. This wild brown was my last fish from the pool a September ago, and it is bordering on a tragedy, that the river seems devoid of such specimens. My total tally of wild brown trout this year is just two, both under 12 inches, taken at the back end of this season. Where the rest and the many juveniles have gone is anyone’s guess. 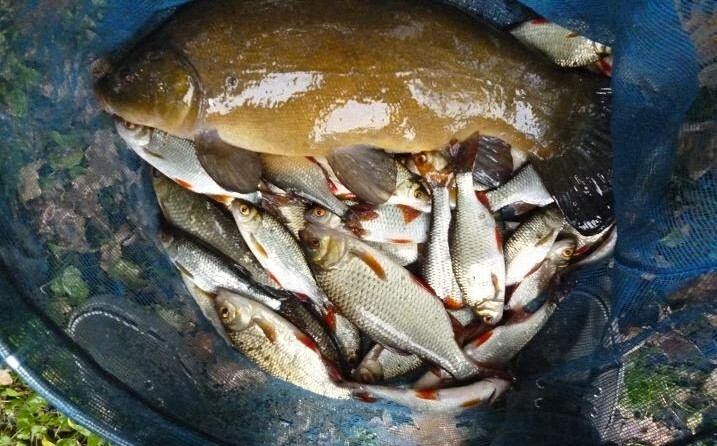 Culprits being blamed are mink, pike and crayfish. A fish survey is booked, which could make depressing reading. What of next year? 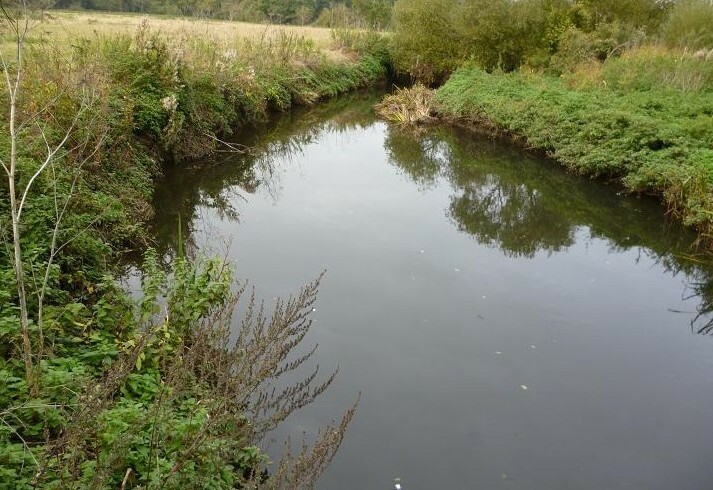 Many members have been disappointed this season and are unlikely to rejoin, although others will be happy to fish for a fresh supply of eager stockies snapping up mayfly, before they rush off downstream towards the Thames.